The City of Pasadena is located in the San Gabriel Valley. This area was once inhabited by the Hahamogna Indians. The name Pasadena comes from a Hahamogna word meaning “Crown of the Valley”. Pasadena was incorporated as a city in June of 1886. At that time, much of the area was covered with oaks and orange groves, with some of the City geography bearing names that reflect the past. Orange Grove Blvd., Oak Knoll, Oak, Los Robles Spanish for “the oaks”, and others maintain the City’s history for current citizens. As Pasadena grew, the need for fire protection grew as well. However, the event that triggered the formation of a fire department was a little known piece of history. In 1885 some boys threw a stone into a building, at the corner of Fair Oaks and Mills Alley, that was being used by Chinese immigrants as a laundry. The stone tipped over a kerosene lamp, which started a fire that burned the building to the ground. The only apparent reason that the fire didn’t spread to adjacent structures was the effort of one Johnny Mills, owner of the building, who fought feverishly to stop the fire’s growth. It is not clear why the area’s Chinese residents were blamed for the fire, although the shacks in the area were close together and run down, perhaps a fire hazard in themselves. In any case, the citizens started a small riot, and threatened the lives of many of the area’s Chinese residents. A deputy sheriff by the name of Tom Banbury stepped in and halted the riot, he made all of the Chinese residents leave the area by the next day. Perhaps considering the great Chicago fire of 14 years earlier, allegedly also started by a kerosene lamp (and Mrs. O’Leary’s cow), the City, with some urging by a Dr. H.A. Reid (later a noted local historian), realized that a Fire Department was needed. 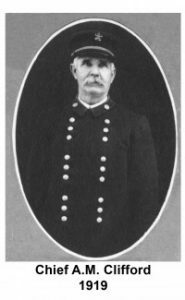 On October 8, 1887, after a delay to raise money, the City Trustees passed a resolution authorizing a Fire Department and the office of “Chief” was created. They allocated just over $1,000 to start the Fire Department. The first Fire Department was simple, at best. The City’s Blacksmith Shop built the first two pieces of fire apparatus, a hook and ladder rig and a hose cart. These were put into service on May 1 of 1888. They ran out of a temporary station on DeLacey, near the Wiley and Greeley’s Livery Stable, which provided the horses. 24 men were selected to be the Fire Department, with 12 assigned to each piece of apparatus. The firefighters organized, and elected officers. John Mills was President, E.A. Russell, Vice President, J.D. Johns, Sec., H.G. Cogswell, Treasurer, C. Russell, foreman, J.D. Jones, 1st assistant, U.T. Monus, 2nd assistant. The firefighters elected Peter Steil as Chief, but the City Council refused to confirm him because he had been convicted of illegally selling liquor a month earlier, and was under a $150 / month fine. On June 19, 1888, the City Council confirmed the other elected officers, apparently not realizing that 18 members of the Department had quit June 16, 1888 under protest of Peter Steil’s non-appointment. A tragic fire occurred 8 days after the regulations took effect, taking the lives of three of the Beaton family children and severely injuring Mrs. Beaton during rescue attempts. The Fire Department apparently took sometime to respond, and was severely chastised as a result, although the authors of some of the history books feel this might have been undeserved. In any case, the City decided to put in a more modern fire alarm system, and dispense with the bell on the church. On December 3, 1889 the Department moved into its first permanent station on Dayton St. between Fair Oaks and Delacy. On January 1, 1890, the Fire Department purchased five horses from Mr. Richard Gird, of Chino for a total of $1,235.30. In the new station, stalls were rigged so that the horses, upon hearing the new alarm, would jump forward into the “traces”, and the harness would lower onto the horse, being secured with spring-type clamps. On Easter Sunday, April 14, 1895, The Royal Raymond, Pasadena’s finest hotel (actually in South Pasadena) tested Pasadena’s best by burning to the ground in less than two hours. High winds were considered a primary cause for the conflagration. This was one of three major hotel fires prior to 1916 in Pasadena, the other two being the Maryland and the La Pintoresca. The Maryland Hotel fire turned out to be particularly difficult to extinguish, as a large natural gas line under the hotel continued to spew forth flame long after the hotel had, once again, burned to the ground. In spite of all efforts, the valve to shut off the gas could not be located until hours later, when it was found underneath a recently poured cement sidewalk. In 1919, E.F. Coop became the Fire Chief, and instituted the two platoon system. Also in that year, Pasadena became the first City to do an aerial survey for the purposes of fire protection. One of the Department’s drivers, W.A. Fuller, helped to organize a new organization in 1923 called the California State Fireman’s Association, and was awarded the CSFA lifetime badge number 1 for his effort. Chief Heutig retired and A.S. Turbett became the City’s second official Fire Chief. George Greeley was his assistant. Then, in 1901, A.M. Clifford (Photo on the left) succeeded Chief Turbett, with F.V. Hovey his assistant. In 1909, Pasadena bought a Seagrave chemical engine*, the first motorized piece of fire apparatus on the Pacific Coast, and only third or fourth in the United States. The Pasadena Fire Department still owns this engine, which was restored by members of the Department and it still runs. 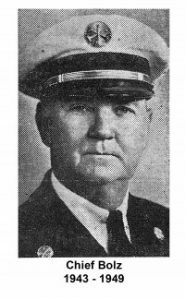 Jimmy Bolz became Chief in June of 1943, becoming only the fifth official Fire Chief in 60 years. He was succeeded by, Stephen H. (Step) Edmonson in 1949, and he in turn by William T. Heidner in 1957. In 1972, James Shern was appointed Chief. He had recently retired from L.A. City Fire as a Division Chief, and became the first black Fire Chief in a major California city. 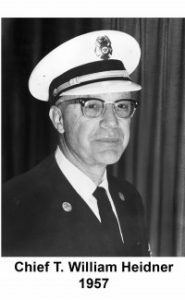 Chief Shern received many honors during his years of service in Pasadena, including being elected president of the International Association of Fire Chiefs. 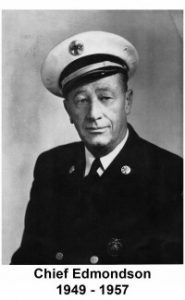 Chief Shern passed away in 1982, and had fire station 36, at 1145 N. Fair Oaks, dedicated in his honor in 1990. 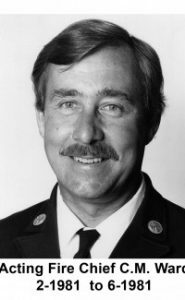 Monty Ward was promoted to Fire Chief in 1981 on a temporary basis. He held the position until Kaya Pekerol became Chief on June 15, 1981. Chief Pekerol had served with the Department since December, 1968, and was promoted from his position as Administrative Chief. 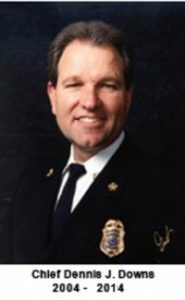 In June 1995, Peter O. Pederson was appointed fire chief. Chief Pederson started his career with the Los Angeles County Fire Department in September 1957. 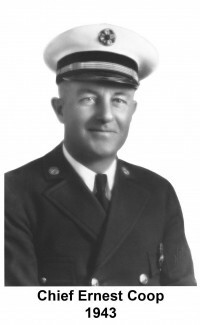 He promoted through the ranks and held the position of Assistant Chief. With a distinguished career spanning 24 years, Chief Pederson pursued his goal and was appointed the fire chief of the Salt Lake City Fire Department in 1981 and led that department for eight years. After a 51/2 year hiatus Chief Pederson came out of retirement to be the fire chief of PFD until April of 1998. In October of 1998 Chief Ernest Mitchell was hired after a lengthy recruitment process. Chief Mitchell had worked as fire chief for the City of Monrovia, and as a Battalion Chief for the City of Compton California. 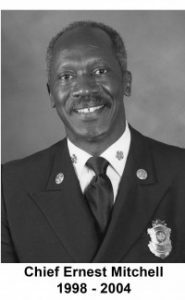 Chief Mitchell had a vast knowledge of the fire service, he currently holds the prestigious position as the president of the International Fire Chiefs Association. 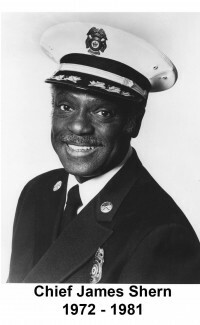 Chief Mitchell retired from the Pasadena Fire Department March 2004. 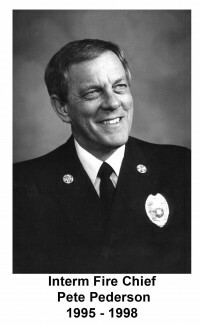 Dennis J. Downs became Pasadena’s fire chief on April 5, 2004. Prior to that, Chief Downs served as the fire chief in Ventura since 1994 and was with the Fresno Fire Department for 15 years, working his way up from firefighter to interim fire chief.